SHOXS and Ares Shipyard produced the seat design, which featured a shock-mitigating seat base to counteract impacts from wave movement, and an ergonomically-shaped carbon fiber bucket seat. The seats are fitted with custom upholstery in premium, marine-grade materials. 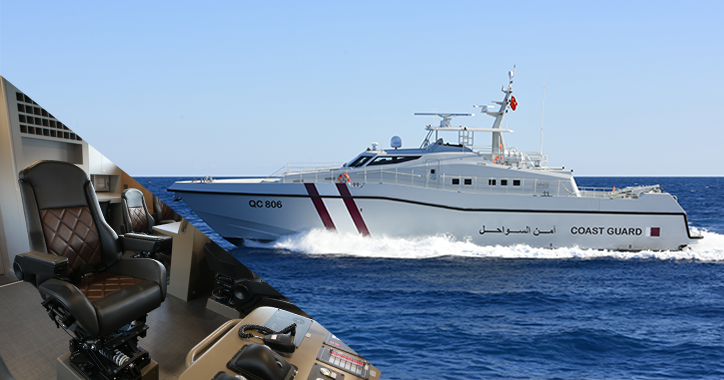 Boats operating in the open ocean are often subject to large shock and vibration forces, especially when designed for continuous, high speed patrols. Exposure to such forces can lead to discomfort, spinal injuries and performance degradation, especially when exposed to forces in the vertical axis. Suspension seating isolates the occupant from the effects of vibration and impact at sea. SHOXS seats are specifically designed and engineered to reduce the risk of operator injury and impact exposure in harsh marine conditions. Learn more about this project and others at the upcoming IDEF Show in Istanbul, Turkey, April 30-May 3, 2019.